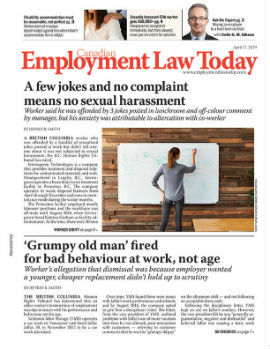 An Ontario worker who was fired for sexually harassing a building cleaner has been reinstated by an arbitrator. The worker was a mail room clerk for the Professional Institute of the Public Service of Canada (PIPSC), a union representing scientists and professionals employed with various levels of government, at PIPSC’s head office in Ottawa. The clerk’s duties took him all over the building, where he became familiar with the building’s cleaning staff, who worked for a cleaning contractor. He often engaged in sexual banter with the cleaning staff, including two particular female cleaners. Whenever he encountered either of them alone, he would blow her a kiss and sometimes grab her buttocks. This behaviour went on for about five years — the clerk started working at the building in 2006 — despite the cleaners asking him to stop. Neither complained about it as they were afraid of losing their jobs.